Japan manufacture in 1985. 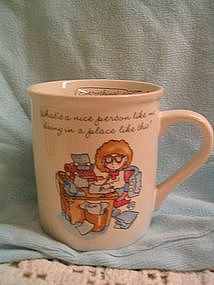 This particular mug is "What's a Nice Person Like Me Doing in a Place Like This" and the rim shot is "Everything!" There is a tiny rim chip and the price reflects this. I did not even know it was there, but before I list my items, I run my fingers over the rim and base. The area is so small as to not show in the photo. I need your zip code to calculate the postage.